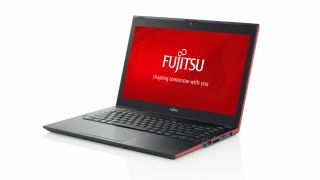 Fujitsu has extended its Lifebook range of ultrabooks with two new models toting Intel's fourth generation Haswell CPU. The company's Lifebook series is firmly entrenched in the corporate world, but recent E-series models (E733, E743 and E753) have gone about business with a heady dose of consumer chic. Unveiled at IFA 2013, the 13.3-inch U574 follows that trend by measuring 19mm thick, weighing 1.6kg and featuring an aluminium lid, along with Fujitsu's trademark red trim. It's also the company's first ultrabook with an HD LCD anti-glare touchscreen. Onboard graphics come in the form of Intel's HD 4400, and Fujitsu is claiming up to 11 hours' use from its internal battery. Connectivty options include two USB 2.0 ports, two USB 3.0 ports, one HDMI port for hooking it up to a legacy monitor via USB, a Kenginston Lock for security, a SIM card slot and a memory card slot. Storage can be configured to the tune of a 500GB hybrid SSD drive or a full SSD drive in 128GB or 256GB configurations. For those less than enamoured with Windows 8's tactile nature, Fujitsu's new 13.3-inch Lifebook U544 offers a non-touch alternative. It possesses similarly svelt dimensions, weighing 1.5kg and measuring 18mm thick, which is just a smite chunkier than Apple's 2013 MacBook Air (17mm). Both models feature embedded 3G/UMTS for on-the-go connectivity, PXE to remote 'boot', an optional Trusted Platform Module and Advanced Theft Protection to soup up security. The U554 is available now, and the i5 version can be yours for a starting cost of £699 including VAT. The U574 will be available from the end of October.